The untapped potential of big data is as significant as the amount of new data becoming available to organizations on a daily basis. Fortunately, the tools needed to realize that potential already exist. But some companies still need to create a culture in which business needs drive the technology that IT embraces. 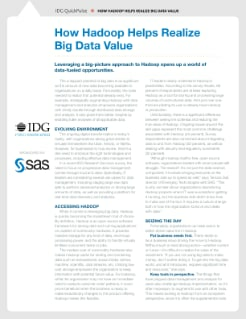 This paper highlights the findings from a recent IDG Research Services survey and explores how organizations can take action to better derive value from Hadoop and the Internet of Things (IoT).